Yesterday, I broached the subject of caring for embroidery needles and using emery (often found in the little strawberry on the tomato pincushions) to polish and sharpen them. Today, I’d like to follow up on that post, just to answer a few questions, mention a few resources, and perhaps get more input from some emery-using pros out there! I’m not a pro on the subject of needle care, admittedly. I’ve never looked it up, found much information about it in books, or even talked to other stitchers about it until yesterday. Funny that the subject wouldn’t come up very often, given the fact that, in embroidery, the needle is pretty much the most essential tool! 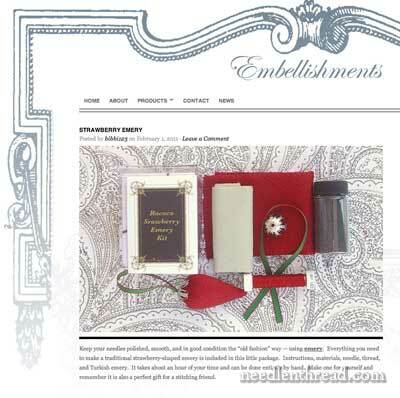 Bobbi over on Embellishments One has a very nice little kit for making your own emery strawberry. It includes everything you need to make a very pretty and practical strawberry, including the Turkish emery. I love the ribbon and the little silver “cap” at the top of the strawberry! Another resource for already made emery pincushions is Etsy. I did an all-items search for “emery” and came up with a whole bunch of emery pincushions and loose emery. So if you’re looking to buy an already made emery pincushion, you might check there for something that strikes your fancy. Now, about emery itself. There are different grades of the stuff. I was told by one company which supplies abrasives in bulk that, for pincushions, the ideal grade would be 220 or 240, which is a finer emery “powder” compared to the gritty size you normally see (which is around 60 grade). I don’t know about this for certain from my own experience, but this person (an expert in industrial abrasives – but not necessarily in pincushions!) asserts that the finer the thing you want polished, the finer the grit should be. And I have to admit, needles are pretty fine. I would imagine that using the fine grade emery would require a lining on the pincushion – and maybe even a double lining. Otherwise, you’d end up with emery powder leakage. When you use an emery pincushion to sharpen needles, I’ve always understood that you pass the needle through the thing in one direction, rather than poking the needle in and out of the surface. This doesn’t come from having discussed it with experts or anything like that – but I was gratified to see that a couple readers commented the same thing on yesterday’s post, so I’m not the only one who does it this way. I don’t know where I learned that, though. Did I read it in a book? Did my sister tell me? Did I see my grandmother do that years ago? I haven’t foggiest. But I’ve always understood that that’s how it’s done. If this is the case and this is the way you’re supposed to use an emery – by passing the needle all the way through – then the very large emery pincushions become superfluous, and the size of the smaller strawberries makes more sense. Another theory I have about the shape of the strawberry for the emery – and I could be Way Wrong here! It’s just a theory! – is that at the tip of the strawberry, the emery is condensed tightly into a small space, and if you really need a good polish or more abrasion, then the tip is a good place to pass your needle through. So the shape gives you somewhat of a variation in abrasiveness, because of the tightness of the emery down in the tip of the strawberry. Hey, I could be wrong. Feel free to smack me and call me silly! Finally, some other questions about needles came up. Handmade Japanese needles: I use these for certain types of metal thread embroidery. If you’re working with metal threads that need to pass through the fabric, then a handmade needle of the right size is a real asset. The round eye that is polished and smooth (no crimps in it from machines) reduces wear on the metal thread. I buy handmade Japanese needles through the Japanese Embroidery Center. At $11 – $21 per needle, they are the types of instruments you really want to take care of. I store mine in a block of felted wool specifically for this purpose. I wouldn’t invest in them for regular needlework with done regular thread, personally. Bent needles: Needles bend, and fine needles bend easily. I have lots of needles that I love that are bent. #10 – #12 crewel needles tend to bend on me more than any other needles, after a bit of use. If the needle becomes too bent to use practically and you’re not able to straighten it (often straightening will make the needle perform worse or break), then obviously it’s time for a new needle. But that gradual bend that forms because of the way you in particular use that particular needle – and the bend just seems to conform just right to your fingers – well. You’re not doing anything wrong there. If the needle still works and it’s comfortable, then no worries! Tarnished needles: These make me nervous. A needle that turns black is not necessarily the best thing to stitch with! If you can polish off the tarnish and keep the needle working easily through the fabric without marring your fabric, then jolly good. If it keeps tarnishing and becomes difficult to pass through the fabric, or risks marring the fabric, I say turf it! Pitch it! Get a different needle! Needle storage: Wool felt is always a great way to store needles. Keep in mind that it won’t repair or polish needles, but it is excellent for storing them. It keeps them lubricated with just the barest touch of lanolin left in the felt. I had a chuckle over the comments on passing the needle through hair to lubricate it. My grandmother used to do this all the time! I’ll stick with the wool, thanks. Come now – your turn! Any more information or input you can add on the subject of needle care? Feel free to add your thoughts! October 3, 2018 On Needle Threaders – and a Really Small One! About 20 years ago, I made a pincushion stuffed with very fine emery. At the time, I wondered about the emery leaking out, so I enclosed it with 2 layers of plastic bag, 1 layer of felt, and then an outer casing of a finely woven cotton. I’ve had no leakage that I can see. For some unknown-to-me reason, I’ve never used it for needles; only for some of my straight pins that either are hard to replace, no longer being made, or very fine like insect pins. Glad to hear that someone else “bends” their needles. I’ve told other of my stitcher friend about my proclivity of bending my needles and they’ve looked at me as if I’m out of my head. Nice to know I’m not out there all alone. They say people who pull their needles using two fingers don’t bend them, but those that use three fingers do. I tried this but I just can’t keep that extra finger off them. I think I need to use three fingers to get enough of a grip so I can pull my needle through what I’m working on. Sorry, I don’t know where I read this. I’ve been beading for over 50 years. That really is a sweet kit. A friend asked me to make a pin cushion for her daughter recently, and I just couldn’t come up with something cute enough. But all this talk about wool and emery has inspired me. Off to the drawing board! P.S. Feel better soon Mary! Thanks for all the info! I knew the strawberries were for polishing needles, but never stopped to think about all the other information. The scientist in me loves it – I really learned a lot. The needle is probably the most important part of needlework and I never give it much thought. Thanks… next question, will any kind of felt work? I don’t think homemade felt would be evenly thick. Pick some up and try stretching it in various directions. If it lengthens don’t use it. Did you know some people are allergic to wool and/or lanolin? I am, so no felt for me. Gracias, por los enlaces, la información y todo lo que de tu experiencia nos permites aprender. In France many stitchers fill their pincushions with flax seeds to help them lubricated. I’ve never tried myself but I am very tempted as I like the idea of using the seeds that produce the linen we stitch on! It feels so organic too. As you may have guessed, I am French and I discovered your blog only a few weeks ago. I must say I am already close to being addicted to your daily newsletter! Thank you so much for all that you share with us. I’m a zoologist and a Medical Technologist so, I wouldn’t use flax seeds this way. The oil inside the flax seeds will go rancid in less than 6 months as they will not be refrigerated, tightly sealed, and will be used in a heated area with good lighting. This is because flaxseed contains a very large amount of fatty acid content, that is, the oils within the seed. It’s not the seed that goes bad, but rather the oils in it. The seeds can also attract mice and some insects. Here is some of what I found out about this. “Oxidative rancidity” is the kind of rancidity that is most likely to damage your flax seed oil. Flax oil contains about 15 grams of alpha-linolenic acid per ounce. Alpha-linolenic acid is a polyunsaturated omega-3 fatty acid not found in a wide variety of foods. Many food scientists look upon the linolenic acid found in flax as the most delicate part of its composition that needs to be protected from oxidative rancidity. There are other types of fats found in flax oil, however, that are much less susceptible to oxidative rancidity. For example, two saturated fats (stearic acid and palmitic acid, each highly stable and containing no double bonds) are found in flax. In fact, flax oil is about 9% saturated in terms of its fat content, making it more saturated than several other cooking oils, including safflower oil and canola oil. This saturated fat component lends stability to the oil. Flax oil – like most other oils – also contains nutrients that help protect its omega-3 fatty acids. The vitamin E and flavonoids found in this oil are important for keeping it stable. Whole flaxseeds, on the other hand, will typically last for 6-12 months when stored in an airtight container in a dark, cool dry spot. My grandmother (born 1892) and her mother, always filled their pincushions with the hairs removed during their daily 100 strokes and saved in the “receptors” made for that purpose and kept on their vanity tables. It took a while to save enough to tightly stuff a sewing size pincushion but was worth it she said because the hair oil lubricated the pins and needles. A strawberry emery was always attached for cleaning and sharpening as necessary. She also made wool felt needle books to store her best embroidery needles in when not in use. Each booklet was about 3×4″ with 4-6 pages and each size of needles had their own page. The felt was so thick each side of one page could be used. In her later years she began using ground coffee as it was too difficult to save enough hair. She let the coffee grounds “air out” until the smell was greatly reduced then stuffed the pincushions. I did find many years later I had to throw those out as mysterious tiny holes had appeared – probably from insects – and the coffe was leaking out. I treasure my pincushion she made using the blue velvet of her wedding suit for the cover and filled with her own hair in early 1900’s right after WWI. I still use it. Thank you for your excellent daily blogs which often bring back lovely memories as well as providing me with inspiration and instruction. Take the finest grade of sandpaper you can find (at least 1000), and cut off a small square – about 5cm should suffice. Fold this in half with the grit side inside. Take your needle and, holding it by the eye,place it in the fold of the paper and very gently turn it round and round. Do not be aggressive with the sandpaper, you only need a very light touch. Then push the needle straight through several layers of cotton fabric, several times until the needle hole shows no discolouration. These needles are made of steel and should always be stored in an oiled felt block to keep them safe and clean. I purchased the same emery kit from the Mad Samplar, in December I think. Have you ever taken a tomato apart? There are needles buried in it from years past, so if you are looking for your favorite needle, that’s probably where it is. A question on cushions: Where can I purchase wool instead of fiberfill to stuff my cushions. I am making some for Christmas presents. I was told to always run diaper pins through my hair to lubricate them. It worked – pin slipped right into the cloth diaper. Of course sometimes I scratched my scalp. Does anyone else remember this: cloth diapers, diaper pins, diaper pail, folding stacks of clean diapers? Elaine, I do remember doing the same thing with nappy pins. Yes! Always ran diaper pins through my hair. I’m sure my mother taught me. And fondly remember wonderful homemade cloth diapers, pins, pails, and stacks. Just trying to get off the followup thing. Much like Margot, the pincushion I made a few years ago is quite tightly packed with a fine emery powder (I’m afraid I don’t know the grade). I packed this in a quite heavy plastic bag, which I then covered with a double layer of a thick calico, and finally a layer of pink silk dupion, just to make it look nicer. As it’s attached to a wooden base I can’t easily pass needles all the way through, but I’ve never found this to be a problem. The needles I’m using in a project and a collection of pins (with pink pearl heads, to match the silk. Well I like it!) all live in it happily. It keeps them sharp and I’ve never had any problems with tarnishing, nor have I ever had any leakage of the powder. I wouldn’t be without it! The pages are sewn together so you can use as is or make a decorative cover which I hope to get to someday. This has been a great little item for storing needles with thread so that I can pick up my project for 15 minutes of stitching. My grandmother had a pincushion filled with her own hair. As a child, I remember thinking it was gross. Now (as a grandma) I’m saving my own hair to stuff one for myself. She also had a sewing kit with an ear spoon…I think I’ll stick with beeswax. http://tinyurl.com/4nlpny7 The wool I received from them was clean, neatly combed and had a nice lanolin content. Some places will supply really raw wool that still has a lot of vegetable matter in it from when it was still on the sheep. One ounce is probably enough to stuff two small pincushions. Anyplace that sells roving for spinners or felters will probably have it, so check with any local knitting shops. Recently in a quilt shop, I bought a kit for making a pin cushion that had crushed walnut shells for the stuffing. The shells are crushed very fine. Supposedly the oil in the shells is very good for needles. Crushed walnut shells are sold in pet stores as bedding for lizards. I wouldn’t use them because these nuts could harm others. If you are making one for a gift, for a sale, let others use your pins, or travel with it, you need to think about people that have a nut allergy. What if my child takes it to school and a friend with nut allergies borrows some pins. Many people, like me, hold pins in their mouth. Did you know some people with nut allergies can’t have any nuts at all on the plane with them? What would happen if this pincushion was on the plane with one of them? It seems like we were a whole lot healither 50 years ago. You only need the tip of the needle sharp, so you only need to put the tip of the needle into the emery. Putting the whole needle through an emery will accomplish nothing more than putting the tip of the needle in and drawing it out. If you have a gold plated needle, putting the whole needle through the emery will wear the plating off the whole needle rather than just the tip. All this ‘talk’ about looking after needles has made me look at my needles afresh! I’m now wondering ….. how on earth are they made? Especially the ones with really fine eyes. Also, what is the difference between hand-made and not hand-made? This out of copyright book on needle making is great. Then, click on the 3 grey lines at top left. Then, under the setting Zoom, click on the + magnifying glass. Then , click on the part of the book’s page you can see on the left. This brings the full page(s) into large, clear, easy to read text. If you don’t do this it looks blurry and worthless to download. You might enjoy the wife’s reply to her husband’s complaint about her doing so much fancy work. It’s at the end of the book, just prior to the ads. I so enjoyed reading the comments and learning of the hair filled pin cushions. I have several needlecases with wool pages that look almost like a small book. The pages I made from felted wool sweaters. Thrift store cashmere sweaters make wonderful felted wool items. The tip on very fine sandpaper is good, as an alternative to a strawberry emery. A small square could be stitched into the back of a wool needlecase. Thanks for all the info and for answering my question if all needles are created equal, as with $20 needles it is clear they are not! I was delighted with your article on emery strawberries, it is for me very timely. in March I am attending our 7th annual Embroiderers retreat which is held over a weekend, this year at a beach resort called Bicheno. I live in Tasmania the little island at the bottom of Australia. We arrive on Friday afternoon and over the course of the weekend 3, 3 hour workshops are available for those who wish to participate. Last year I was asked if I could take a workshop and I said yes and thought of my Strawberry emery. One of the things I enjoy about embroidery is watching my fellow unpack their embroidery things and seeing all the lovely embroidered treasures that come out of work baskets. In 1992 I was doing a gold work workshop and the lady opposite me whose name is also Mary had a needlework shop she was also very passionate about Hardanger and works it by the mile. as she unpacked she draped herself in a beautiful Hardanger chatelaine and continued to produce other gorgeous little bits and pieces to go with it. I had drooled over them all day and by the end of it I had complimented her on it many times and plucked up enough courage to ask her if she had the pattern in her shop,she did of course and I rushed over the next day and bought it. The pattern “Hardanger Stitcher’s Treasures by Janice Love was just to die for and included a strawberry emery which I had not seen in Mary’s stuff.Thrilled I went home with great ambitions to make it up. It was 10 years before I made it and I have been complimented many times on it just as I did to Mary. So at our Retreat I will show them how to make an emery strawberry, there won’t be a Hardanger cap on this on, just a little felt one with some daisies embroidered on Solu-web then dissolved and secured in place on the felt with a French knot. your information has given me lots more to talk about and a good excuse to push your web site and daily newsletter. Thankyou Mary. I always have lined my emeries with a tightly woven cotton muslin, the seam stiched by machine with a small stitch length. I’ve made the outer covers with cross stitch on linen, velvet, and cotton. I use the same pattern for the cover to make up the liner. Often the emery comes in a little baggie and if it works, I leave it in that baggie when I inset it in the liner. I usually add a bit of fiberfill at the top, where the strawberry is gathered to close–that helps contain the emry and makes finishing the top a bit easier. I’ve not had a problem with leekage. The other thing I’ve done is purchase premade emeries and just cover them with a decorative cover. Easy! Running the needle through the hair isn’t nearly as bad as waxing thread with ear wax. Many old sewing kits had a special tiny scoop to get it too. Anyway regarding needle sizes, I did a search for a size gauge similar to those for knitting needles. I didn’t find those, but did find a couple of charts with the dimensions. So if one were REALLY wanting to know the size it could be done, and a caliper (dial or digital from the hardware store) would make it much easier. I didn’t compare every entry, but the ones I did check are the same. If someone were REALLY REALLY enthused, they could drill holes in a piece of metal and make a gauge. John James Needle Company has one for you. Go to this page and click on the needle you want to know about. Then under the kind of needle, I’ll use TAPESTRY / CROSS STITCH NEEDLES as an example, click on Size Guide. You will see the product description with the exact measurements of each size of that kind of needle. Thanks for the followup on needle care. I am allergic to wool so my needle book has cotton batting – I just use the emory strawberry more faithfully. Now I know what to do with my too-large strawberry – make 2 small ones and use the emory in them! I do think pushing needles all the way through may help with one problem, I seem to have a burr in the eyes of several my favorite needles, I’ll try running them clear through and see if that helps. When the eye is bad you have to toss it. You would need a sandpaper-like item, that will fit inside the eye, to remove a metal burr there. You might want to talk with a furniture finisher about polishing. I know they start with a lower grade of sandpaper and work down to the finest grade. So using a finer grade of emery makes sense to me. Skip anything higher. Running your needle in one direction makes sense as well. At least to me. I image under a microscope you would see the fine polishing marks on the needle. The marks are all in one direction. Backing out of the emery as in an up and down motion would leave polish marks in two directions and may not be as polished as you like. I hope this makes sense to you as it does in my little mind. Maybe sharpening a knife is similar. You stroke it against the steel in the same direction and then switch sides. Thanks for the info. I was searching for more info on “strawberry” emeries. I have not made one, but have always had one. The pin cushions I make I stuff with carded wool and/or crushed walnut shells. I do remember talking (probably with my mom or grandma) about saving hair to make a pin cushion. I also make needle books with wool felt. Hi, Mary. Your grandmother wasn’t crazy: clean hair will do what wool does for slightly sticky needles and even scissor blades. I learned this from a fellow fashion design student when I was at Parsons. I saw her sliding the inside edge of one half of her shears across the top of her head! When I asked her what she was doing she explained that it made the scissors work without sticking. I do it occasionally myself … very carefully. In the 60’s I did a Window Dressing Course and the nails that were used were like fat common pins which had to be pressed into wood using your fingers only. So the trick was to run them through your hair beforehand. Strangely enough it worked, but our teacher was “bald”. 1. My mother (who lived through the dust bowl days and the 1929 Depression) used to tell me to put my needles on the floor and rub them back and forth with my shoe to “sharpen” them and to remove any rust that might have accumulated because of sweaty fingers. 2. Our eldest adopted daughter told me that her mother used her hair to keep needles sharp. She asked me to run the diaper pins through my hair before trying to pin my baby’s diapers so they would slide better. I can see both methods as they relate to pincushion abrasives and fine oils used in modern sewing rooms. Somewhere along the line I learned to rub the tip of my crochet hooks up alongside the outside of my nose. It made working with them go much smoother. Next Next post: Wool Embroidery Project: One Leaf. One Lousy Leaf.